First registered corporate logo appeared on three-wheel trucks in 1930s. Representing the flow of river of Mazda hometown, Hiroshima and also form the Latin alphabet letter M, which is duplicated three times for “Mazda Motor Manufacturer.” The long side extensions represent wings for agility, speed and ability to soar to new heights. Registered in 1951, in the same year when the son of Jujiro, Tsuneji Matsuda took over presidency of Jujiro and became the 3rd president of Mazda. Started to export the three-wheel truck to overseas countries in 1949 and along with the expansion of its exports, needed to adopt the logo for overseas countries. This logo was registered first in Taiwan in 1954, and until 1959, the registration completed for 21 countries worldwide. Seen on Mazda R360 coupe or other passenger cars until 1974. This timeless logotype was introduced in 1975 and used until 1997. From 1991 to 1997 five different types of brand mark were adopted by sales channel. The brand symbol, close to current one, was adopted in 1997, with the V-shape wings inside, standing for “growth” and “improvement” and Mazda logo in Mazda blue. Fast forward to the end of the 20th century, the current Mazda brand symbol was adopted in June 1997. The symbol stands for Mazda’s determination to “pursue ongoing improvements to drive powerful, continuous growth”, expressed by a pair of wings shaped like a letter M in an oval. The V-shaped wings are also suggestive of Mazda’s flexible thinking, creativity, vitality, kindness and resilience. Daring to stand up to seemingly impossible challenges, and standing against all odds to pursue its dream. Committed to making cars with excellent quality with a firm belief that new technology can only be developed from overcoming tough challenges, the spirit of Mazda lives on in its brand symbol. Renewed in 2015, representing the brand which has evolved toward the higher quality and sophistication. Have you ever noticed that if you look at Mazda’s corporate mark, all the letters, except a letter D, are in lower cases? 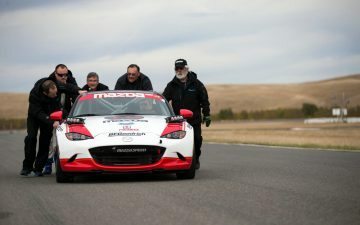 That was by design – Mazda wanted to express precision and reliability as a car company by aligning top and bottom lines of its corporate mark. A letter D in a lower case protruded the upper line, so the decision was made to use an upper case for a letter D to make the corporate mark neatly fit into a rectangle.